The Steelybin® has been designed to offer our customers industry leading quality and value. Certified to EN 840 and in accordance with noise regulations, this container is a welcomed addition to the Straight product range. 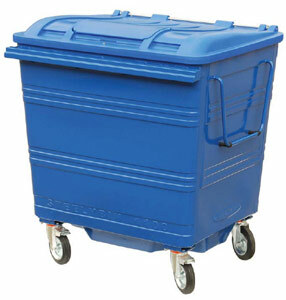 The tough and reliable Steelybin® is manufactured from 1.5mm thick mild steel panels to an approved design with internally fully welded seams. The Danish handles, which are fitted as standard, improve manoeuvrability. A sump base aids stability when the container is moved and a drain plug enables the discharge of any liquids. The container is also fitted with a lid lock and features a chip nest area allowing a standard RFID chip to be used. The Steelybin® is available in a range of colours with three lid options: a recycling lid with apertures for bottles and cans, a recycling lid for paper or a standard lid for general refuse. The container can also be personalised with vinyl graphics or logos stamped into the body. Made from galvanised steel and comes with the option of powder coating. a recycling lid for paper or a standard lid for general refuse. Fully welded internally on all seams. Logo area recessed on front panel to protect graphics. Danish handle as standard to improve manoeuvrability. Two off swivel and two off swivel brake castors (200mm diameter wheel). Chip nest area allowing a standard RFID chip to be used. Sump base for extra stability when the container is moved. Drain plug on base for easy emptying of liquids. Comb lifting edge is compatible with all standard lifting equipment. All lids fitted with a lid lock as standard.